Pioneers in the industry, we offer float and board level gauge, level indicator, reflex level indicator, water level gauge indicator and float and board type level indicator from India. “KABIR” Make Float & Board type Level Gauge is used for fluid level measurement in several industries. The Float which is, of course, the most important element of the instrument. In fact, its structural design, volume displacement, weight, and buoyancy force are all taken into careful consideration when a float is specified for a particular application. This type of Float & Board type Level Gauge basically works on the principle of buoyancy. The float is well connected to the counterweight along with a pointer through flexible wire ropes. The pointer slides along the guide against a graduated scale to indicate corresponding levels inside the tank. Most often, the Float & Board type Level Gauge finds its application in underground and over head storage tanks. They are also used in storage tanks of petroleum products, like furnace oil, diesel, and lube oil and so on. Also, it is used in storage of vegetable oils, molasses, silicates, glucose and so on. In short, the Float & Board type Level Indicator is most widely used in all nonhazardous and nonpressurized tanks. For Tank height more than 10 meters we provide Anchor Plated with Anchor Housing for Installing the Anchor Rope. “KABIR” also offers Vapor Seal Type Float & Board type Level Gauge which is generally used for tanks having corrosive fumes/vapors OR N­2 [Nitrogen] Purging tanks. In this level gauge the float is connected to a magnetized counter weight moving in a sealed S.S. OR PVC pipe & which drives a follower magnetized bi - color capsule inside a glass tube to indicate liquid level. : The features of a typical Float & Board type Level Gauge can be detailed as follows. It has dust proof pulley housing. It comes with an SS bush bearing for a smooth rotation of the pulley. The pointer cradle has 6 PP rollers and adjustable brackets for easy mounting. It has a noncorroding aluminum board with controlled cross-section geometry and a wide painted scale with prominent multi-color marking. The indicator, of course, has a slack float with the large diameter of higher accuracy. This level indicator is very easy to transport as well as install. KABIR” Make Float & Board types Level Gauge are used for fluid level measurement in several industries. The Float which is of course the most important element of the instrument. In fact, its structural design, volume displacement, weight, and buoyancy force are all taken into careful consideration when a float is specified for a particular application. : This type of Float & Board type Level Gauge basically work on the principle of buoyancy. The float is well connected to the counter weight along with a pointer through flexible wire ropes. The pointer slides along the guide against a graduated scale to indicate corresponding levels inside the tank. 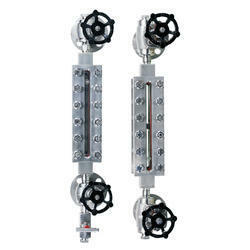 : Most often, the Float & Board type Level Gauge finds its application in underground and over head storage tanks. They are also used in storage tanks of petroleum products, like furnace oil, diesel, and lube oil and so on. Also, it is used in storage of vegetable oils, molasses, silicates, glucose and so on. In short, the Float & Board type Level Indicator is most widely used in all non hazardous and non pressurized tanks. For Tank height more than 10 meter we provide Anchor Plated with Anchor Housing for Installing the Anchor Rope. “KABIR” also offers Vapor Seal Type Float & Board type Level Gauge which is generally used for tanks having corrosive fumes / vapors OR N­2 [Nitrogen] Purging tanks. In this level gauge the float is connected to a magnetized counter weight moving in a sealed S.S. OR PVC pipe & which drives a follower magnetized bi - color capsule inside a glass tube to indicate liquid level. The features of a typical Float & Board type Level Gauge can be detailed as follows. It has dust proof pulley housing. It comes with an SS bush bearing for a smooth rotation of pulley. The pointer cradle has 6 PP rollers and adjustable brackets for easy mounting. KABIR offers Reflex Level Gauge for the Measurement of liquid level at a glance in a tank. This is particularly using for High pressure OR High Temperature OR Toxic Liquid Storage Tanks. These gauges have a prism glass window that uses the basic optical principles of light refraction reflection to enhance the indication of the liquid level. In brief when the light strikes the area of glass covered by the liquid is allow passing to the Interior of the gauge. So that the area appears dark (Black). While the light strikes the open space, above the liquid level is reflected back to the observer so that the area appears silver-white. We can clearly see the actual liquid level in the systems. Looking for Level Indicator Gauge ?